Thanks in part to the U.S. government’s recent spending binges, a group of Canadian authors say that Canada now has the better business environment. “If the United States continues on its current course,” write Brian Lee Crowley, Jason Clemens, and Niels Veldhuis, “Canada will find itself without peer as a magnet for investment, immigrants, innovation, and growth.” They make this prediction in their new book, The Canadian Century: Moving Out of America’s Shadow. But the issue isn’t just fiscal overstretch by the United States. They point to what they call Canada’s “redemptive decade” from 1988 to 1997, when politicians of all political stripes supported a program of free trade, trimming the extensive Canadian welfare state, and reducing both taxes and the government’s debt burden. Despite some backsliding, those reforms will be the basis of Canada’s prosperity, say the authors. They’re certainly right about the recent role reversal. In the latest issue of The Heritage Foundation’s Index of Economic Freedom, Canada ranks as the seventh freest economy in the world, one spot ahead of the United States. That’s the first time Canada has been ahead of the United States in the rankings, and most of that switch is attributable to a declining U.S. score. The Vancouver Sun’s most influential columnist, Barbara Yaffe, is telling her readers to read my new book (co-authored with my good friends Jason Clemens and Niels Veldhuis), The Canadian Century: Moving Out of America’s Shadow. To protect and grow its economy, Canada will have to cosy up more aggressively to Uncle Sam — even as this country moves to overtake the American behemoth on economic competitiveness. That’s the intriguing message from three public-policy gurus writing in a newly published book sponsored by the MacDonald-Laurier Institute, a non-partisan Ontario-based think-tank. The Canadian Century: Moving out of America’s Shadow, by Brian Lee Crowley, Jason Clemens and Niels Veldhuis, spotlights a “Redemptive Decade” — from 1988 to 1998 — of smart fiscal policy by the Mulroney Conservatives and Chretien Liberals, years that saw the introduction of free trade and the GST, cuts to public spending and an overhaul of entitlement programs such as welfare and pensions. We’re in a position, the authors assert, to start offering lower tax rates than the U.S., a significant change from the past, when the U.S., with a smaller government and lower taxes, was always the more appealing place to invest. But even if Canada takes advantage of this “enormous, historic opportunity,” and even if it manages to further diversify its trade, this country will remain overwhelmingly dependent on the Yanks for its continued well-being. The reason? Canada does not function as a single economic entity: “We are a deeply integrated part of a continental economy and the border represents perhaps the single greatest threat to our ability to seize the opportunity” afforded by Canada’s fiscal standing. – A jointly administered perimeter border around North America along with a Canada-U.S. customs union. – A newly created governing body of MPs and members of Congress to manage binational issues, assisted by a tribunal to resolve cross-border disputes. The pitch for closer integration — always controversial for Canadians, who fret about the destiny of mice who engage too closely with elephants — is not entirely new. In the past, the notion has mostly gone nowhere because the U.S. government is so preoccupied elsewhere and the concept is likely to prove difficult politically in both countries. Anyone who remembers the modest initiative Ottawa and Washington sponsored several years ago, the Security and Prosperity Partnership, understands how good intentions — in that case, an effort to harmonize business regulations and standards to expedite trade — can falter. The SPP became so mired in politics, with nationalist lobbies on both sides of the border raising a stink, U.S. President Barack Obama killed it on coming to office. The authors probably have a better chance of getting their ideas enacted on the book’s second major theme, Canada’s new-found ability to outmanoeuvre the U.S. when it comes to attracting North American investment. 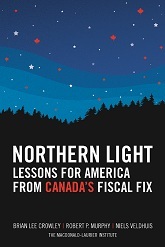 The book praises Canada for efforts in the ’80s and ’90s that brought federal program spending from 21.7 per cent of GDP in 1994 down to 17.9 per cent by 1998. But, worryingly, it notes that Ottawa lost its fiscal focus after 2000. Federal spending has jumped from 12.9 per cent in 2008 to 14.5 per cent today. “There is substantial risk that current federal policy will undo the fiscal reforms of the Redemptive Decade. Indeed a great deal of the progress has already been undone,” the authors write. The free-spending Harper Government clearly will need to stiffen its spine if it’s to preserve Canada’s hard-won fiscal advantage. My new book (co-authored with Jason Clemens and Niels Veldhuis), The Canadian Century: Moving Out of America’s Shadow, is coming out soon! We’re having a national launch party in Ottawa on May 20. Click here to register for this event. Macdonald-Laurier Institute (MLI) Fellow Jason Clemens was at the University of Windsor yesterday to talk about The Canadian Century: Moving Out of America’s Shadow. Canadian Century will be the first book published by MLI, and is co-authored by Jason, Brian Lee Crowley and Niels Veldhuis. The book is published by Key Porter, one of Canada’s largest publishing houses, and will be available in stores in late May 2010. If Sir Wilfrid could see us now. Canada’s seventh prime minister, Sir Wilfrid Laurier, who served from 1896 until 1911, was known for proclaiming the 20th century as Canada’s. You may also know him as the man on the $5 bill. But according to a new book co-authored by University of Windsor business alumnus Jason Clemens, Laurier’s prediction was just 100 years ahead of its time. “Canada sits on the edge of an opportunity, and that opportunity is the Canadian century, which was Wilfrid Laurier’s famous, one of his famous sayings,” Clemens said Thursday at a lecture at the Odette School of Business. Clemens said Canada’s strong economic fundamentals, among the leaders of the G8 in most categories, and its ability to keep debts in check have it poised to bolster its stature compared to the debt-burdened U.S.
Clemens has co-authored The Canadian Century: Moving out of America’s Shadow, along with Brian Lee Crowley and Niels Veldhuis. The book hits the shelves in May. Clemens said Laurier was a classical liberal who believed in small government and low taxes, and Canada followed his core beliefs for about 50 years. “He was not only interested in policy, he was interested in an aspiration for this country,” said Clemens. Canada’s government was consuming 15 per cent of the economy in 1965, but by 1992 that had grown to 24 per cent. “As we deviated and started spending more, what we didn’t do is raise taxes,” said Clemens. Clemens said the return to Laurier’s values — and the shrinking of the red ink mountain — began with Brian Mulroney and continued under Jean Chretien. “Canada is a fundamentally more conservative country now when it comes to debts and deficits,” said Clemens. Clemens said Canada’s position contrasts sharply with that of the U.S., which will be limited in what it can do for a decade or more because of crippling debts. century would belong to Canada. He had a plan to make it so. dwelling instead in the long shadow of the United States. stay the course â€” make us the envy of the world. reforms enacted at the end of the twentieth century, completing the work already begun. embrace Canadian-style courageous and far-seeing reform. merely off by 100 years. Brian Lee Crowley is the author of the national bestseller Fearful Symmetry: The Fall and Rise of Canadaâ€™s Founding Values. Crowley is Managing Director of the Macdonald-Laurier Institute for Public Policy and is a frequent commentator on political and economic issues for the CBC, Radio-Canada and many other media. His website is www.brianleecrowley.com. He lives in Ottawa. throughout Canada and the United States, including the Globe and Mail, the Financial Post, the Washington Post and The Wall Street Journal. He lives in San Francisco. programs across the country. He lives in Vancouver.